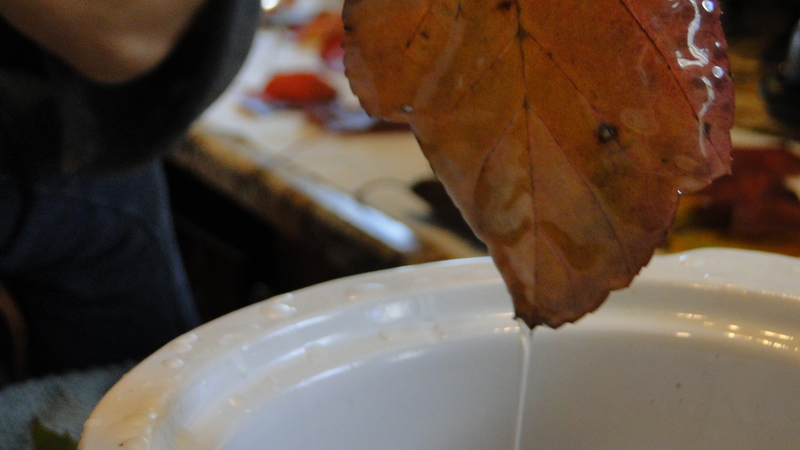 Capturing a Gift….or How to Preserve leaves in Beeswax. 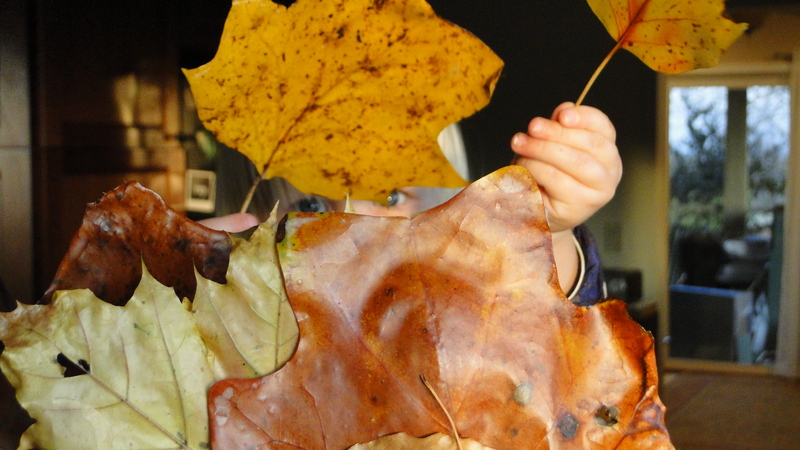 Go out and collect some leaves. 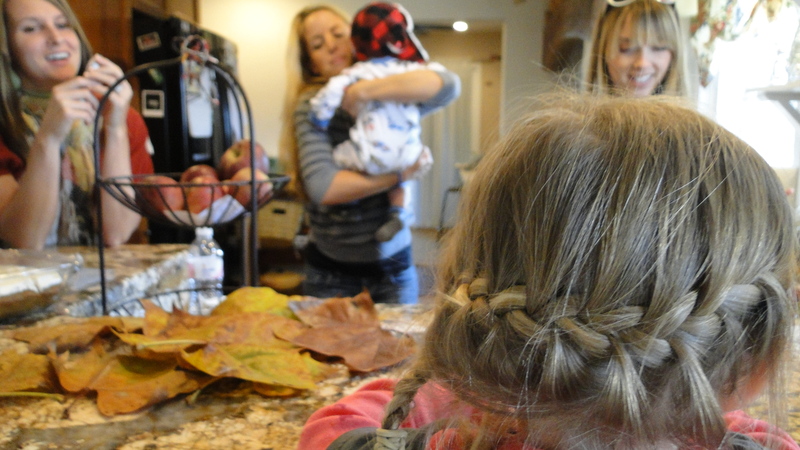 Be even more amazed when one person brings a two and half year old with a spiral french braid in…. which never fell out!! And another brings a two year old with white furry boots to your farm… and the furry feet stay gleaming white all day! With a mini crockpot of melted beeswax….ohh and your whole house just cozy smelling of honey and everyone ooohhing and ahhing with the smells and colors of fall. and turn it into art captured. 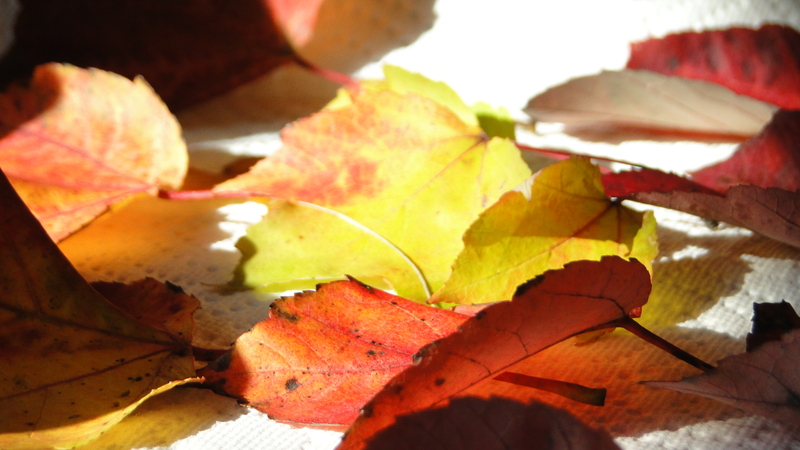 So with your collected leaves …. just dip them briefly in the melted beeswax and leave to dry briefly on a piece of wax paper. The honey colored wax brightens all the colors and feels like you have captured sunlight. 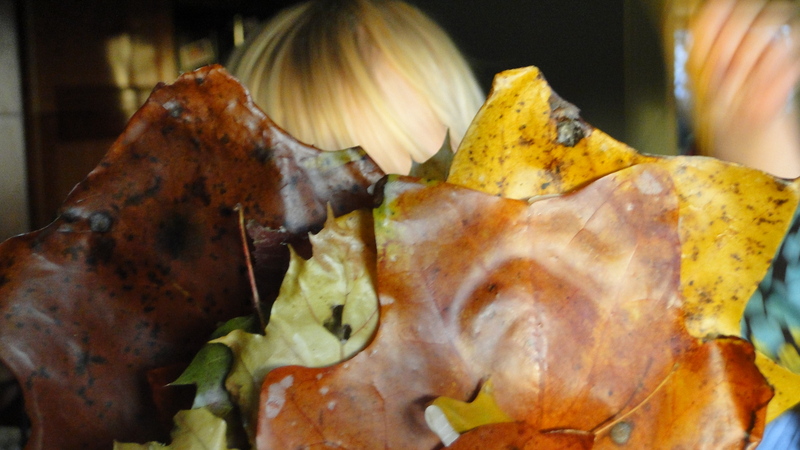 and in a way you have…in your family…in your friends… and lastly in the leaves. can we capture it and make it art. You and me..and few dozen kids. I make a garland and string them high above the mantle. I have many strung from a wreath…which I hang like a mobile near a window. So the light catches in the leaves. I fill some hurricane glasses with the really pretty ones. One of the girls is making a wreath from them by wiring the stems together. They actually look lovely and feel absolutely pettable…so it’s nice to just leave baskets of them out. We also just use them in our art as each child sees fit. **** This is a back to the future post.. I did this Wednesday and we have been happily adorning the house with all our waxed leaf goodness. I am still waiting on some art supplies that I stupidly ordered from two separate locations and I have half of my order from one place and am now stalking the U.P.S man every time he drives by! ← Shhhh… You are Loved. I love this!! So want to try it! I love that multi-colored leaf. 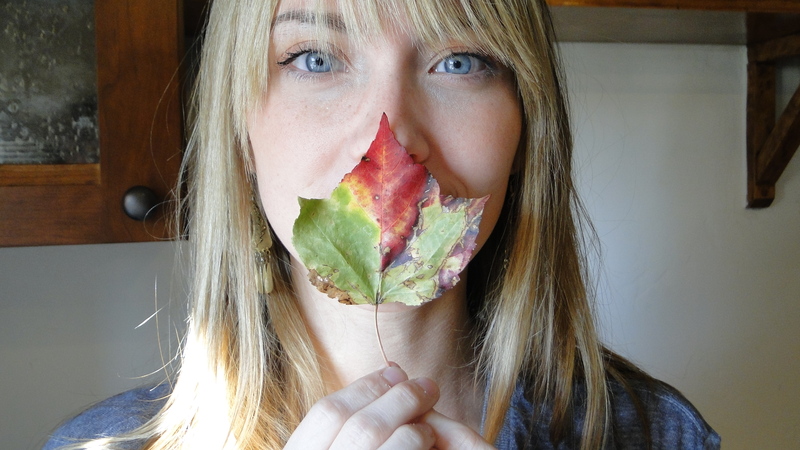 It has all the steps of changing colors in one leaf. That is awesome. I often wondered, do they crack at all? Like the wax cracks and then falls off? ya know.. I have mine hanging up for a loooooooooooooong time and I have never had that happen. I think if they were to be heavily handled yes.. the wax would break off.. but I have left a basket of waxed leaves out and we have used them for graphing and sorting colors for the little kids… and they have remained…so they are pretty long lasting. I LOVE this idea! Putting in on my to-do list right now. Thank you for sharing… I have written my gratitude words on each leaf and wondered how I could save all these Eucharisteos without them all breaking away… Now I am really excited! Oh what a great idea. 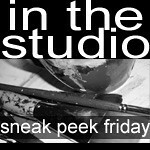 if you put pictures on your blog let me know.. that is a super awesome idea! what a cool idea! I can’t wait to give it a try! I have always wanted to do this. But I live in the desert and alas, there are no pretty colored leaves 😦 Maybe I can do it with cactus needles! Ohh…hmm… Wonder what your season equivalent could be? 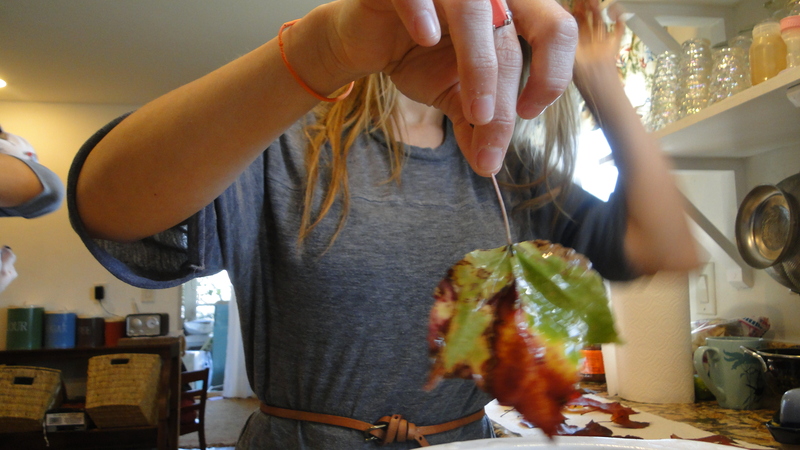 Oh love this idea of preserving leaves! Totally pinned it. Beautiful. Thank you for linking this to Your Green Resource. Oh thank you I love that! This is beautiful! What a great idea. I was actually just thinking to myself that I wish there was a way to keep fall leaves from deteriorating. Thanks! yes, thank you we (my sister and I + kids) have been doing it for a few years.. but this was the first time we opened it up to others…everyone really enjoyed it. Ive never heard of doing this. Each year we journey to my parents house in N Ga to be “leafers”. This year life just got in the way……. I am enjoying the bits we do have here. I wonder if my husband would mind if I took ALL the leaves off the red maple in the front yard to do this? ha ha! He bought it for us to have a bit of Fall like he remembers from his childhood. A house full of littles and mommies….. what a sweet day. oh then you must try it… it is so nice. 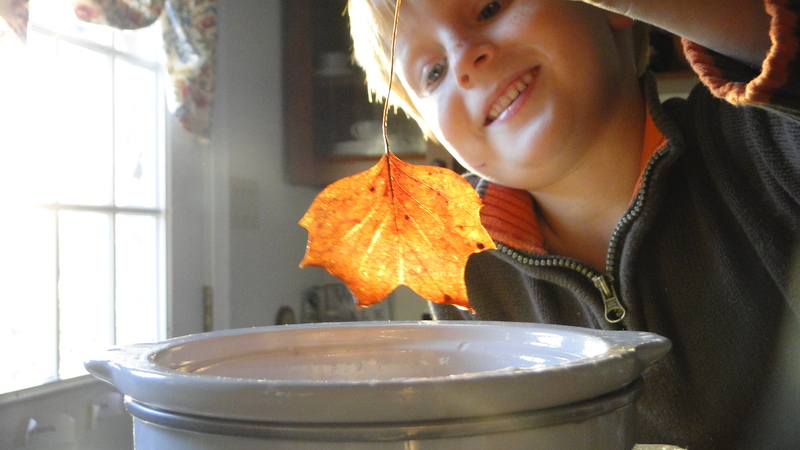 not messy at all.. we actually have left the little warm crockpot with wax going for days.. kids keep finding beautiful leaves to capture. REALLY!?!? Oh my goodness I have to try this! oh you totally do and let me know how it goes. oh i am so happy you liked it. that is a really great link up I learn so much. it definitely is a keeper. I have to remember this for next year. I would love to use the leaves for a fun tablescape. a table scape is a great idea. I remember doing this as a kid but could not remember HOW it was done! Thank you for sharing. oh good.. yep it is very easy. Visited high sierras this weekend, I wanted to take home those lovely huge fall leaves, but dint know how to preserve…great post! Oh yes it is so easy.. and I have left the little crock pot on warm for days…so we have been dipping as each beautiful leaf comes in. i love this so much!! thanks! oh it is really easy and turns out lovely. Lovely. Can you pay some pics of the wreath/mobile? Do you add honey to the beeswax?